Chris Matthews has been outed as the latest media liberal to be outed as a sexual harasser protected by his network bosses. NBC has admitted to just how much they gave the newsman when attempting to pay off his victim. “Two sources familiar with the situation told The Daily Caller that Matthews paid $40,000 to settle with an assistant producer on his show, ‘Hardball with Chris Matthews,’ in 1999 after she accused him of harassment. An MSNBC spokesperson contested that claim to the Caller, saying the company instead paid significantly less as part of a severance package. “The woman complained to CNBC executives about Matthews making inappropriate comments and jokes about her while in the company of others. 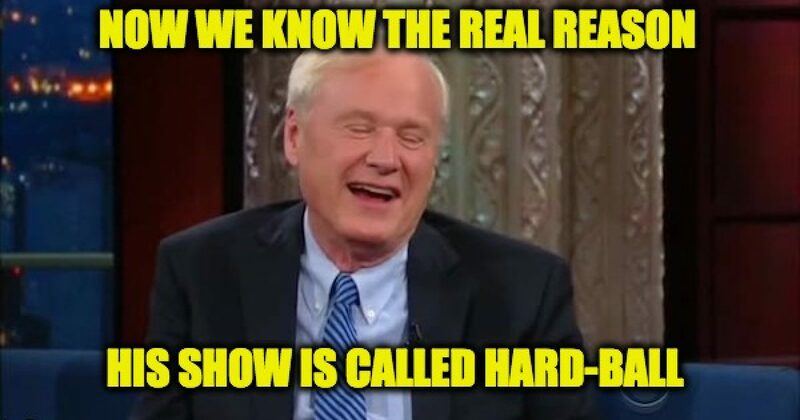 A spokesman for MSNBC on Sunday confirmed a report that a staffer at the news channel nearly two decades ago had been paid and left her job after she complained she was sexually harassed by “Hardball” host Chris Matthews…. This is a has been a bad run for NBC News properties they already cut ties with Morning Joe analyst Mark Halperin in October following multiple allegations of sexual harassment, another frequent Morning Joe guest former Congressman Harold Ford Jr. was lost to the show when he was fired from his job at Morgan Stanley for “harassment, intimidation, and forcibly” grabbing a woman several years ago and assault from a dozen women, and the biggest loss when Today host Matt Lauer was dismissed for multiple cases sexual harassment. What we don’t know yet is now that Chris Matthews has been publicly outed will other accusers get the courage to go public? Generally, that’s what happened with others. While there are incidents on both sides of the political fence, this latest wave of sexual harassment seems to be dominated by the liberals, who hypocritically accuse their political opposition of waging a war on women. Politically active on the left Harvey Weinstein, John Conyers, Charlie Rose, Al Franken, Michael Oreskes, Tavis Smiley and others have been accused of sexually harassing or worse assaulting women. But my fellow conservatives shouldn’t get too cocky. First of all, there are some conservatives who have crossed the line also. And while the majority of the men accused of harassing women lately are on the left, last year the harassers were on the right led by many at Fox News. The truth is sexual harassment is a scourge that must be ended on all sides.